If you're using UPS, USPS, or FedEx to deliver any of your holiday packages, you'll need to know their holiday cut-offs. Keep in mind that while carriers will try their hardest to abide by these cut-offs, it's always smart to add a day or two to your own shipping cut-offs to account for inclement weather. December 18 - Deadline for UPS 3 Day Select shipments. Most deliveries will be on December 22nd. December 20 - Deadline for UPS 2nd Day Air shipments. December 22 - Deadline for UPS Next Day Air shipments (Saturday Delivery must be enabled, purchased, and visible on label). UPS Next Day Air deliveries will be made on December 23rd. December 15 - Deadline for USPS Standard Parcel Post shipments. December 20 - Deadline for USPS First Class Mail and Priority Mail shipments. 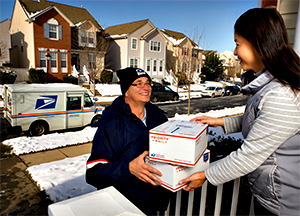 December 24 - Deadline for USPS Priority Express Mail shipments. December 11 - Deadline for FedEx SmartPost shipments. December 15 - Deadline for FedEx Ground shipments. December 18 - Deadline for FedEx Home Delivery shipments. December 19 - Deadline for FedEx Express Saver shipments. December 20 - Deadline for FedEx 2-Day and 2-Day A.M. shipments. December 21 - Deadline for FedEx Standard Overnight, Priority Overnight, and First Overnight shipments. December 25* - Deadline for FedEx SameDay shipments. *Even though FedEx offers such a close deadline, SameDay isn't a 100% guarantee that it will arrive during the 25th. SameDay service is also limited by distance. For all international shipments, contact your representatives. Depending on distance between origin and destination, as well as ever-changing customs requirements, it's a good idea to get your carrier to suggest a ship-by date for your specific international shipments.